The new city banners depicting some of my photographs. It has taken a few months to get to this stage. 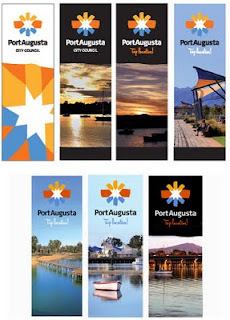 Port Augusta is an attractive city but for many years its industrial roots permeated promotional materials and the minds of people who live elsewhere. The banners are the first step in moving towards a new look for promoting the city as a family friendly city followed soon by a new look website. Part of the brief was to use recognisable landmarks/ features. I am delighted to be involved in this initiative as I have been quietly promoting Port Augusta through my images for years. 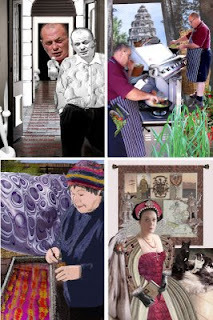 I am currently working on my first solo EXHIBITION which will be held in the new Yarta Purtli Galleries in March 2010. This builds on some experimental work that I produced last year and portrays local identities in unique situations. In each case participants are offered the opportunity to bring aspects of their life into the mix or create virtual realities. This has meant taking many support photos which are digitally manipulated to create the final image. It has been a lot of fun so far and I look forward to creating more. Some how over the last 5 years I have become a photographer!!!! People are beginning to associate me with the craft and this week I was employed to record the Premier's visit to our town. Primarily it was an opportunity for the young man who is the Labor candidate for this area in the next election ( the previous Liberal Member is retiring ) to be seen and photographed with Ministers and the Premier of South Australia at various functions. It was an interesting day and I met some old aquaintances at the Aged Care facilities and attended the opening of the Pakani Arangka Unit at the Port Augusta Prison. This is a new concept where young Aboriginal males can be housed in a unit which is like a home and given the opportunity to see the Flinders Ranges (cultural and spiritual significance) and work on developing an outdoor area and garden. It has taken a while to take the first step in creating a personal BLOG but here I am . I'll be interested to see where this journey takes me. For the past 5 years I have connected with the world using FLICKR http://www.flickr.com/photos/georgiesharp/ and this has introduced me to people whose company I have enjoyed and led to experiences I would never have dreamed of . Blogging may offer the opportunity to expand on some of these experiences.